Headphones, the lead track from Sere Trouble's latest EP, was our tip on Shell Zenner's Amazing Radio show a few weeks back. 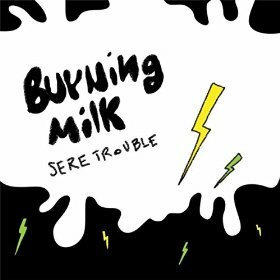 The EP, entitled Burning Milk, has now been released in full and across the five songs Sere demonstrates that she's an artist to be reckoned with. Headphones opens the EP, a tale of a chance meeting outside the pub with someone who commented "I love your headphones" and questioning whether the person's intentions were something more. Mixing some angelic pop-tinged harmonies with a rasping lead vocal, it's clear that Sere has a real ear for challenging her audience. The rest of the EP takes its lead from Headphones although the four songs are very different in their approach and their style. Drink Myself To The Ground announces itself with a shuffling drum pattern and a bold electronic beat that come in and out throughout the song, but it's Sere's vocals that steal the show again, the lyrics accentuated by the passion that pours out, the way words are emphasized precisely to drill home their message. In The Sun is dominated by a brilliantly constructed chorus where two contrasting vocals collide; a delicious harmony in the background penetrated by an insistent compelling "take these shades off." Inertia is probably our favourite of the five songs on the EP. It's slightly more restrained than the other four songs, but is wrought with the expectation and tension that it's going to explode into violent life, stopping at points for breath then starting again, and that keeps the listener rapt and the smoky seductiveness of its killer line "I found my peace with you" and some of the keyboard hooks enthrall this listener. What's In Your Head starts as if it's going to whisk us off our feet and take us to the dancefloor, but it resists the temptation to lose itself in hedonistic abandon and provides a canvas for Sere to really demonstrate the range in her voice which tells the story of the songs here as much as the words themselves. Sere describes herself in her bio as a "rock star in the making" - we think on the basis of Burning Milk that she's doing herself a disservice. The EP delivers something much more complex and rewarding than your traditional rock and roll.